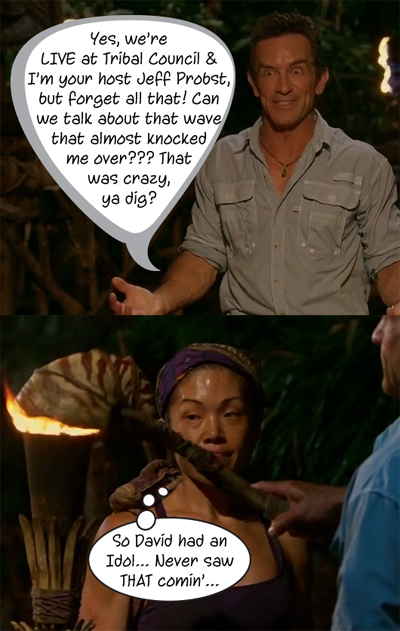 This time on Survivor, for real now… Sooo when the Gen Xers return to camp, Jessica is immediately on damage control duty, but Chris doesn’t want to talk to her; he’d rather talk to her in the morning. When she and Sunday turn to Brett who actually DOES want to know what happened, Chris is suddenly in the mood to talk. Jessica explains the situation with Paul saying that if there were an all-male alliance, she would be in trouble – it had nothing to do with the two of them. She understands the guys are angry, and she’s really hoping it wasn’t a bad idea. The next morning, Sunday and Lucy are asking themselves the same basic thing – did they make a mistake? Sunday says they just need to give the guys some time. The problem is that the guys really trusted Jessica and Lucy doesn’t really trust her now either because she’s the one who planted the seed that grew into the blossom that was Paul’s eviction sooo… Jessica is on Lucy’s radar now. Later, Lucy talks to the guys, says it’s a game, mentions that Jessica was spear-heading the whole thing, but as far as Ken and Dave go – she’s got them. They completely trust Lucy. 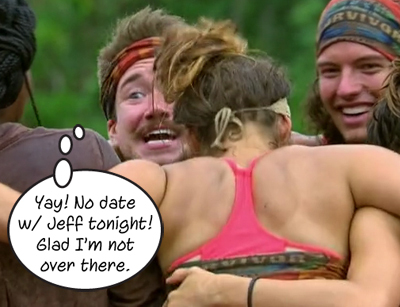 After she departs the scene, the guys both agree – If they go to Tribal, Jess is gone. Over at the Millennials camp, the kids are hungry and they have spied some pig tracks so it’s pig-huntin’ time. Instead of a pig, though, they see a goat and decide to sneak up on it to snag some food for themselves. 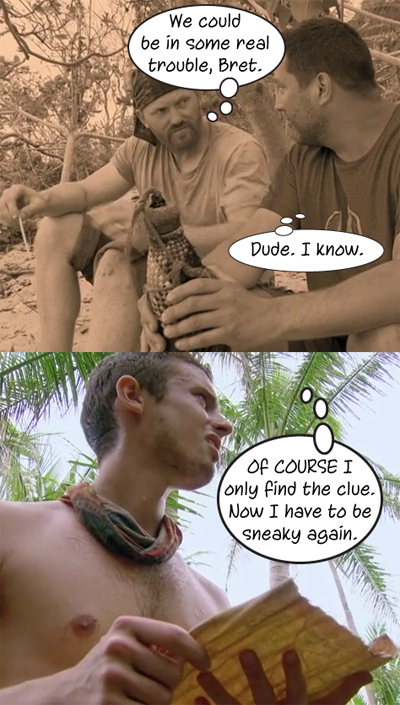 While the rest of the tribe it tracking down the goat, Adam is searching for an Idol and he find a clue to the location of one so he returns to camp to look another time. When the Millennials return to camp, the boys all agree that the girls rocked that challenge and Michaela is definitely the MVP. Adam knew he wouldn’t be great at that challenge and he makes an excuse to leave camp to search for the Idol. His clue says the Idol his SHELtered so he starts looking for shells and just when he’s about to give up, he see it. IT’s a huge clam shell with the tribe motif on it. Aaand, he it takes him awhile, but he gets it open and JUST after he throws the clam into the tall grass, Hannah comes into the scene off screen and asks how he’s doing on his Idol hunt. LoL He says he’s working on it, she tells him good luck then walks away and Adam asks if she saw him with it. Of course Adam is happy, he’s doing this for his mom, she has lung cancer and it’s pretty bad. After an emotional moment with Adam, because his mom is also a super fan… He’s beside himself and overcome with feelings. Over at the Gen X camp, David and Lucy leave camp to get water. He wants to know what the plan is if they lose the Immunity Challenge – Lucy will give it to him later. David is worried he and Ken are still on the bottom so they want to make sure they vote with the majority. After Ken joins them, Lucy tells them the vote will be for Jessica and if she sees them talking to anyone else, she’s gonna be upset sooo they just better not do that. And if they tell Jessica… Ken does NOT like this at all. They went from one dictator to another and he’s not havin’ it. Come on in, guys! It’s time for Immunity and this one is pretty cool and not like any challenge we’ve seen before except for the puzzle at the end. SO. First two people race to obstacles to a chair that is situated with pullies. One tribe member will be lifted up by the others to retrieve letter tiles in bags that are numbered; they have to retrieve them in numerical order in increments of ten, then they have to race back. After all 30 bags are on the mat, they unpack the bags to see the letters to unscramble a phrase: Somebody loses their flame tonight. Survivors ready? GO! So… Chris and Figgy race to be lifted and clearly, Chris was a good choice for the obstacles, and he moves pretty fast with the letter tiles, but he is a big guy sooo… He has a good lead racing back to tag Ken into the chair and he’s in it before Michelle begins her race to the chair. David is tagged to get in the chair as Michelle finishes and he’s half way to 30 as Michaela begins to retrieve letters. So! Gen X starts the puzzle first, but the great equalizer does the job it was designed to do and takes away the lead Gen X had the whole challenge. After 20 minutes, everyone is still working on the puzzle then Gen X has an idea, but the Millennials are focused; they aren’t looking at the Gen X table and certainly can’t hear Jeff yapping. After 45 minutes, both tribes think they have something, but with the help from their tribe, Figgy and Michelle have figured out the phrase and just like that Millennials win Immunity. Back at the Gen X camp, the mood is low. Chris is nervous, but he knows there is the blindside plan to vote out Jess, but he wants to talk to Lucy who confirms that Ken and Dave are on board. 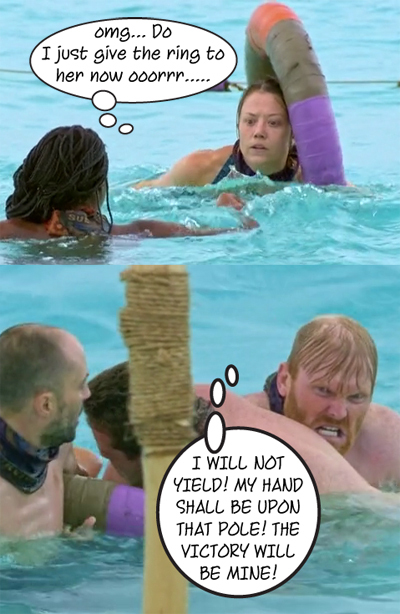 Lucy talks about control and how if no one else wants it, she’ll take it and she hopes this works as well for her on the island as it does for her at home; even if no one likes her for it at home. Elsewhere, Ken is telling Dave that he did not like how Lucy approached them earlier and if they vote Jess out, they, and CeCe will still be at the bottom. Ken wants to himself, Dave, CeCe, and Jess to vote for Lucy and have Jess try to pull Sunday into the vote. Later, Dave talks to CeCe and she is down for the Lucy vote, but they have to end the convo quickly because Lucy is nearby. Elsewhere, Ken is giving Jess the news about Lucy and the boys and Sunday targeting her, definitely, and tells her that she needs to talk Sunday into voting out Lucy or she’s going home. So what does Jess do? She goes and tells Lucy and Chris what Ken just told her!!! David has a private talk with Ken about it then it’s confrontation time. He tells Lucy he doesn’t know who he’s voting for because he didn’t like the way she approached him because he’s an adult and he doesn’t like to be bossed around and treated like a kid. Basically. That’s not verbatim. She thinks he’s being emotional and should be happy he’s still in the game. 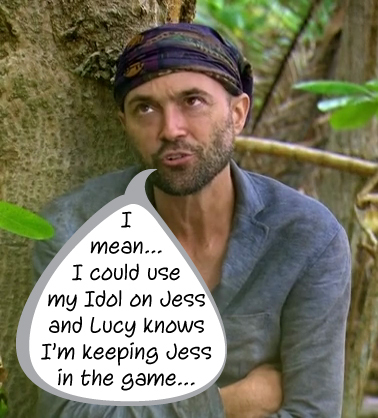 Dave is conflicted because he doesn’t want Jessica to go, but he admits he lied to Lucy’s face when he said he didn’t know who he was going to vote for at Tribal. He COULD use his Idol to save Jessica so he’s not back on the bottom again, buuut… He wants to hang onto his Idol too. So that’s why he’s all conflicted. 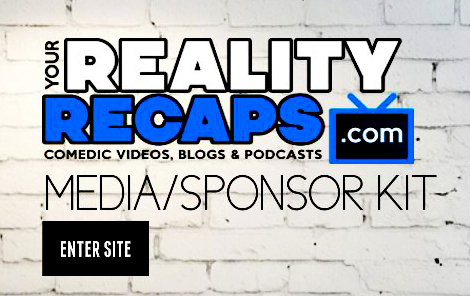 Next Article “Over The Top” Fans This #BBOTT Season!